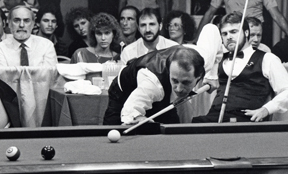 1986 International Resorts Last Call for 9-Ball . Dec. 19, 1986 . Atlantic City, N.J. The Resorts International "Last Call of 9-Ball" had plenty of peripherals to add a little drama to the final. The 395-player field was the largest ever (to date); the top-heavy prize fund offered $40,000 for first and a mere $6,258 for second; and an ESPN crew of 15 buzzed around the action filming ten episodes worth of the action. Mike Sigel and Nick Varner were the last two standing in the gigantic field that featured every player of significance, minus Efren Reyes. Varner cruised through the winner's bracket, squeaking by Jose Parica, 9-8, and Jose Garcia, 9-8, to earn the hot-seat. Sigel took a more circuitous route through the field, after dropping his third-round match against Parica. Captain Hook did his part to narrow the bloated bracket by winning 10 straight on the losers' side. He then sent Garcia packing in the one-loss final, 9-4, to meet Varner. Sigel plowed straight through the field. As the two set to chalk it up for $40,000, legendary road player Utley Puckett offered a quick summation of the final. "You've got a match here between two even players, but Sigel's got the moxie," he said. "When he's playing for the big money, he never misses a ball." That prediction loomed large as Sigel took an 8-4 lead in the race-to-9 final. Varner played safe on the 5, burying the cue ball behind the 7. Sigel tried a masse around the blocker, but referee Ron O'Brian called a foul, claiming the cue ball skimmed the 7. O'Brian then consulted a TV monitor near the final table - the first instant replay in pool history. The 7 ball didn't seem to budge upon review, but O'Brian trusted his eyes. "From that angle on TV, I admit it looks like the 7 ball wasn't touched," he said. "But from where I stood, the cue ball did hit the 7." Astonished, Sigel took a seat, and Varner cleaned up to close the gap to 8-5. But the controversial call wouldn't be an impetus for a Varner comeback, and Sigel took the next rack for the win.